2 | Oncology Advances New monoclonal antibodies for multiple myeloma co- developed by hemato-oncologists at the Jerome Lip- per Multiple Myeloma Center at Dana-Farber/Brigham and Women's Cancer Center could become the next blockbusters for this malignancy. According to results from two recently published clinical trials, the new drugs have impressive efficacy in patients with re- lapsed and relapsed/refractory disease. In particular, patients who no longer respond to best available ther- apy for myeloma have a median overall survival of just nine months. These life-extending new therapies ad- dress a significant unmet medical need. 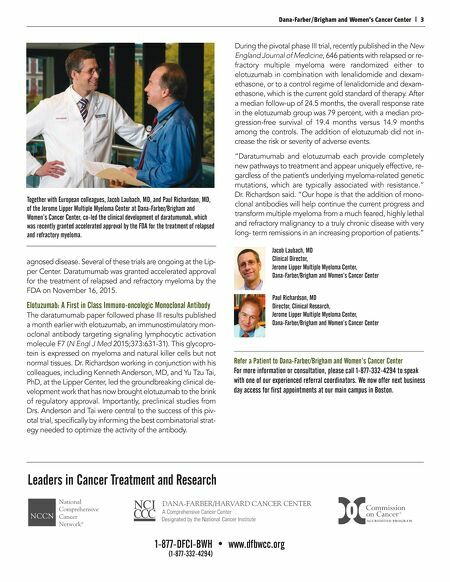 "Monoclonal antibody therapies have for some time been used in the treatment of other blood cancers, but to date have not been an option for multiple myeloma, which makes the results of these recent studies particularly exciting," said Jacob Laubach, MD, clinical director of the Jerome Lipper Multiple Myeloma Center and assistant professor of medicine at Harvard Medical School. "The FDA approval of daratumumab in November is a very important mile- stone in the field, as the availability of this agent, and eventually other monoclonal antibody therapies in de- velopment, will undoubtedly benefit our patients." Anti-CD38 treatment elicits responses in relapsed and re- fractory multiple myeloma Together with European colleagues, Dr. Laubach and Paul Richardson, MD, the clinical program leader and director of clinical research at the Lipper Center and RJ Corman Professor of Medicine at Harvard Medical School, co-led the clinical development of daratu- mumab, a human IgG1 antibody that targets the CD- 38 transmembrane protein expressed abundantly on malignant plasma cells. Results from a phase 1/2 study performed in collaboration with Henk Lokhorst, MD, PhD, professor of hematology at the VU Medical Uni- versity Medical Center in Amsterdam, The Netherlands, and Torben Plesner, MD, professor of hematology at the University of Southern Denmark in Odense, Denmark, recently showed that daratumumab has remarkable single-agent activity – including complete responses – in patients with heavily pretreated and refractory myeloma (N Engl J Med 2015;373:1207-19). During the dose escalation phase of the study (part 1), 32 pa- tients were given daratumumab at doses ranging from 0.005 to 24 mg/kg. After no maximum tolerated dose was detected, the study proceeded to a dose expansion phase (part II). A total of 72 patients were given daratumumab once weekly Dana-Farber/Brigham and Women's Cancer Center Research on Monoclonal Antibodies Shows Promise in Multiple Myeloma (eight doses), then twice monthly (eight doses), and then monthly for up to 24 months at either eight or 16 milligrams per kilogram (mg/kg) body weight. The best results were ob- served at the 16 mg/kg dose, which was associated with an overall response rate of 36 percent. Among patients who re- sponded, two achieved complete responses and 65 percent remained progression-free for more than a year. Toxicity was minimal and limited mostly to grade one and two events in- cluding fatigue, allergic rhinitis, pyrexia, nasopharyngitis, and cough. Based on these results, various other clinical trials with daratumumab have been launched, including two phase III tri- als in the relapsed setting and one in the setting of newly di- Trial Design Part 1, a dose-escalation phase, included 10 dose cohorts (0.005, 0.05, 0.1, 0.5, 1, 2, 4, 8, 16, and 24 mg per kilogram) (Panel A). The two lowest-dose cohorts (0.005 and 0.05 mg per kilogram) had a 1+3 design, and the other eight cohorts (0.1, 0.5, 1, 2, 4, 8, 16, and 24 mg per kilogram) had a 3+3 design. Part 2, a dose-expansion phase, included five dosing schedules (Panel B). 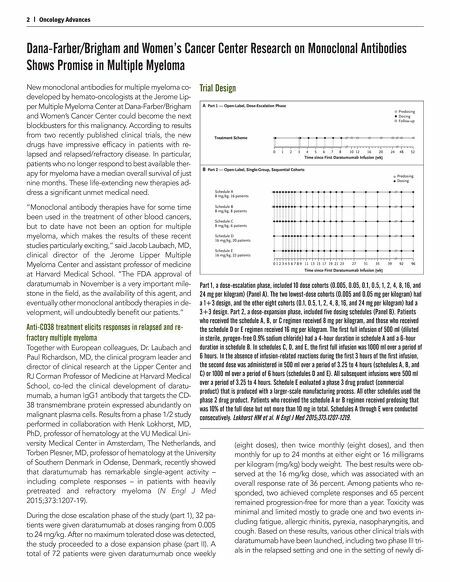 Patients who received the schedule A, B, or C regimen received 8 mg per kilogram, and those who received the schedule D or E regimen received 16 mg per kilogram. The first full infusion of 500 ml (diluted in sterile, pyrogen-free 0.9% sodium chloride) had a 4-hour duration in schedule A and a 6-hour duration in schedule B. In schedules C, D, and E, the first full infusion was 1000 ml over a period of 6 hours. In the absence of infusion-related reactions during the first 3 hours of the first infusion, the second dose was administered in 500 ml over a period of 3.25 to 4 hours (schedules A, B, and C) or 1000 ml over a period of 6 hours (schedules D and E). All subsequent infusions were 500 ml over a period of 3.25 to 4 hours. Schedule E evaluated a phase 3 drug product (commercial product) that is produced with a larger-scale manufacturing process. All other schedules used the phase 2 drug product. Patients who received the schedule A or B regimen received predosing that was 10% of the full dose but not more than 10 mg in total. Schedules A through E were conducted consecutively. Lokhorst HM et al. N Engl J Med 2015;373:1207-1219.